I really, really like the idea of time-traveling. It makes for some amazing storylines and if done right it can be absolutely wonderful. 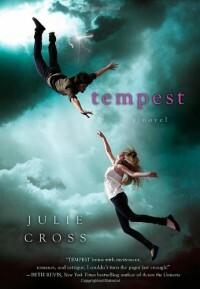 And though I wasn't as in love with Tempest as I would have liked to be, this was an extremely well-done tale of time-traveling!! The scientist in me gleefully cackled at the actual well, science, that was involved in all of it! Jackson is smart and he works together with another even smarter guy to try and figure out how it's all happening and I loved that! The science did slow the storyline down somewhat, but I didn't really care about that, cause it was just so awesome! I love understanding how things work! I also really liked that Jackson didn't always have complete control over his time-travels, no instant-skills and all that. Also, there are consequences if you push yourself too far and I liked that as well. The thing that did bother me about all of it was that when Jackson time-traveled back to 2007 and couldn't find his way back to 2009, he seemed more concerned about his love-life in 2007 then the actual getting his life back and learning more about why the hell he and his girlfriend Holly were attacked in the first place. And stopping it from happening again. But Jackson gets his priorities straight after a while and when that happened the story REALLY picked up for me! I LOVED the last third of the book! I mean, I really enjoyed the first part too, but after that I just couldn't stop reading until the end! There were some major things being revealed and there are still some things that have left me going: WAIT! There HAS to be more!! I'm really curious about Jackson's sister and the little girl that appears towards the end (weren't the scenes with both these girls amazing?? I LOVED them!). So yes, I am most definitely picking up the next book cause I'm dying to find out where Julie Cross will take us next with her storytelling! Also, the end was kinda heartbreaking, but I've never respected Jackson more, I don't know if I could have done the same thing. The wait for the second book will feel like an eternity I fear... (I wish I had time-traveling skills and could just jump to the time when it was already out, read it, and come back, that would be awesome).